What if you could help your students to think globally? In this session, participants will learn about how other schools and districts are addressing the college and career ready need for global competence in our youth, as well as have an opportunity to apply a design thinking framework to begin planning for students. Presenters will present the findings from the report “Educating for Global Competence: Preparing Our Youth to Engage in the World” and provide concrete practices to achieve these results. 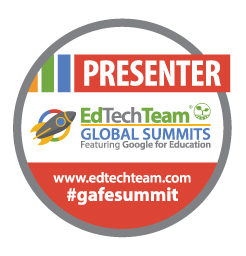 Come learn about strategies to increase your student’s global and cultural understanding through the use of technology tools that allow you to communicate and collaborate with classes around the globe! Ideas and resources will be shared and time will be given for hands-on exploration of some simple tools for communication and collaboration. Some of the tools to be highlighted include Skype in the Classroom, ePals, Google Hangouts, and Twitter. The 2016 ISTE Standards propose that students, as constructors of knowledge, have the ability to “critically curate a variety of resources using digital tools to construct knowledge, produce creative artifacts and make meaningful learning experiences for themselves and others.” But what, exactly, does it mean to curate? And, how is critical curation different from collecting information and conventional student research projects? How can we design meaningful curation experiences that will fuel learner passion and build learning communities? Participants in this interactive workshop will develop and apply the mindset of a curator in designing a curation project for their students and/or communities. Powerful professional learning can happen on Twitter. In this session, the presenter will share how she uses Twitter to tap into an ever-present education network she can rely on for ideas, resources, and support. Explore the basics of how to set up and use a Twitter account, manage your time, participate in education chats, and make connections on Twitter and beyond for your own personal and professional learning. It’s not about compliance, and it’s not about the grade. It’s about the feedback! Try your hand at designing a game-based formative assessment for digital age skills during this hands-on session. Curiosity. Questions. Student ownership of learning. Passion. Do you see evidence of these in your classroom? Would you like to? Join us to discuss the power of student curation to engage and ignite a passion. Is your learning management system (LMS) a tool for learning or a tool for managing learning? How can teachers breathe life into this “management” system to create an inspired learning environment? This interactive panel will include ideas from teachers, parents, students and you! Come share and learn.